INTRO: Hiya! I am a student at Concordia Lutheran Seminary in Edmonton Alberta and was invited to contribute something to this blog, which I was happy to do. I may in the future try to do some content just for this blog, but I am also blogging at twokingdoms.ca and thought I would start by sharing a sermon that I had posted there. If you go to the blog, there is a link to an audio version. Let me know what y'all think! Sept. 30/12, 18th Sunday after Pentecost, The Gospel According to St. Mark, 9:38-50, Riverbend Lutheran Church, Edmonton, AB. “Grace to you and peace from God our Father and the Lord Jesus Christ.” Amen. 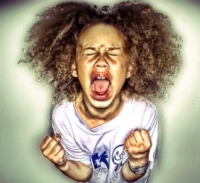 Those of us that are parents recognise this for what it is; a child’s tantrum. Though, every child in here or anyone who has ever been a child recognises themselves in this. We can all picture it, can’t we? A little child, completely out of control of themselves; lost in the emotion of the moment. Their eyes glaring upwards at their parent, tears and stuff from their nose running down their faces, little fists balled with rage, every muscle in their bodies tense, red and purple in their little face, screaming. Every fibre of their being is defiance and anger personified. What they are too weak to do with their bodies they do with their words, lash out and try to hurt. And they want to hurt. You have denied them something, or said something that annoyed them, or are simply not catering to their desires with enough speed. And their wrath boils up and pours out. How dare you not buy them that toy? How dare you not give them a cookie? How dare you make them eat the thing they hate? How dare you put them to bed? How dare you?! They want to yell, they want to kick, they want to hit, they wish they could hurt you, they wish they could drive you away; they wish they could…crucify you.